I am frequently asked “why”? Are you nuts! Predictably, these are expressions of curiosity from my friends in Alexandria, not those of my childhood growing up on Delavan Lake, Wis. What I am describing to my neighbors and friends in Old Town is the sport of iceboating. Arguably, the coldest sport in the world with wind chill numbers that are mind numbing. From mid-December to mid-March, weather conditions permitting, one will see ice boaters gliding across lakes or tributaries of the Chesapeake Bay. 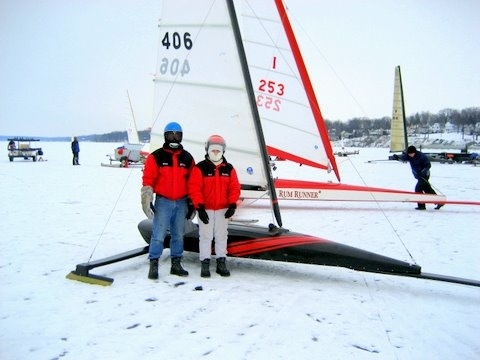 The sport of ice boating can be found any where in the world where a body of water freezes to the depth of at least 4-6 inches without substantial snow cover. Additionally, there must be sufficient size to allow for maneuvering room to sail the boat safely. The world capital of iceboating is Lake Geneva, Wis. the next lake over from Delavan Lake. The Potomac River will normally freeze over especially above the 14th street Bridge most winters. In 1966, I remember walking on the ice by the Lincoln Memorial my freshman year at GWU. That winter parts of the Chesapeake Bay froze solid enough for some limited iceboating by smaller iceboats. I am sure there are some old-timers in the area that can tell similar tales of seeing iceboats on the Bay. Iceboating is not new; it is not a sport derived from advances in technology associated with the past 100 years. In fact, there were iceboats on the canals of the Netherlands in the 1600’s to move cargo. Controlled from the back, stern-steered they were the boats that came with the settlers to the New York City area and the Hudson River in the 1700’s. It wasn’t long before Americans figured out how to make the boats sleeker and faster. A sport was born with races, clubs, and regattas. The new boats were easy to assemble, fast, exciting to sail; easy to operate by one person controlling the trim of the sail and steering the boat via a front runner. The most popular boats on the ice today are the DN’s, Skeeter’s, Nite’s and Renegade’s. The A Skeeter is the Ferrari of iceboating capable of 100 mph plus speeds. 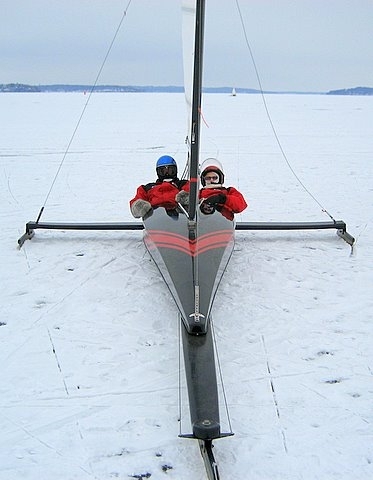 However the one-person DN remains the most popular ice boat in the world. Sailing an iceboat up wind is much the same as sailing on “soft water,” but down wind completely different unless you’re sailing an asymmetrical spinnaker equipped boat like an E-Scow. The key ingredient for ice boats is sensing your boat speed in relation to wind strength and direction especially heading down wind. As your boat speed increases the apparent wind continues to shift forward. You constantly have to make directional adjustments to account for increasing speed. If you sail directly down wind the boat slows down likewise sailing too far into the wind on an up wind course will stall the sail and the boat slows dramatically. Ice boats can tip over, they can spin out of control and they can be going so fast that the boat is out of control with usually disastrous results. There are a plethora of things to worry about when sailing an ice boat. First and foremost are other ice boats on the lake. Ice boats go very fast especially off the wind. Closure rates between boats can be very dangerous if not understood; most dangerous when you have different classes of boats with different boat speeds sailing on the same lake. The E Skeeters can be going three times as fast as a DN and twice as fast as a Nite. The same rules of sailing on “soft water” apply to sailing on “hard water” with some minor exceptions; i. e. the windward boat has right away over a lured boat. You really need to pay attention when changing direction in an ice boat. You always stay off an ice boat race course when a race is in progress, especially if your ice boat is slower than those boats racing. Personal experiences over many years of ice boating have created an ice boating culture. We are a unique breed. No sport is more at the mercy of wind and weather. Ice boaters skip work to sail their ice boats because it can only be done when conditions are right. Cold doesn’t bother us. There are winter seasons when there is no ice boating. You must sail when you can. For some reason ice boaters always set up directly in front of the bars along the lake shore. After “cheating death” once again and lowering their body temperature to “numb” they come in for refreshment and relaxation while they warm up and watch their competition still on the ice; once “fortified” they go out for another run. When the ice and wind are just right boats are not put away until dark. Sails come down, boats are placed on blocks to get them off the ice, runner blades are removed and the cockpits of the boats are covered to keep any snow from accumulating. Then it is back to the bar to recap the days sailing. Not unlike the tradition of comradeship engendered in the Old Town Cup Regattas of the 1980’s and 1990’s in Alexandria. Authors note: You can see videos and pictures of ice boats www.iceboats.org. From there you can go to the Skeeter, Nite, DN, etc. sites. « Erik Thor Sandberg at the Katzen!